It's been awhile since I've bought any clothing in M&S. I swerved the Alexa Chung range as nothing really tickled my fancy. If I look in any of their sections Limited Edition is the one I am most likely to purchase from. Having worked in M&S years ago I do tend to shy away from buying anything there, when you've once enjoyed staff discounts it's hard to pay full price for anything, though these days they are getting better and better with the 20% days. Anyway when I popped in their Bath store yesterday I thought I'd just seek out the Limited Edition ruffled gingham check blouse I blogged about last time. I started flicking through the rails there were some great bargains to be had! I ended up with this shirt and a denim skirt....and it hasn't stopped there. I tried on the size 10 shirt in this picture but I sized down and went for the size 8 as I wanted it to be fitted. 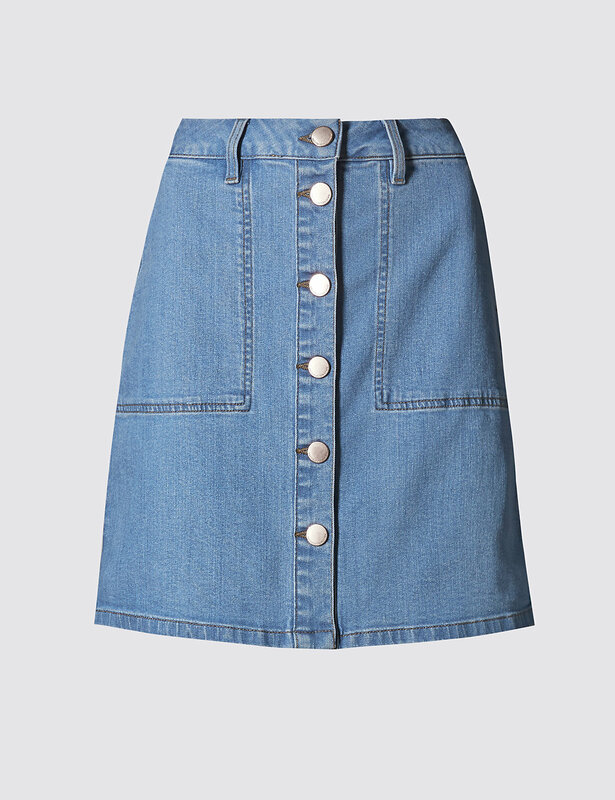 The denim skirt is gorgeous, such a lovely flattering shape. It's got a bit of give in it and it's a great length too. I bought the size 10, sizing is spot on I would say. I love it so much that I'm trying to track it down in the paler colour......and that's the ace thing about the M&S website, if it's sold out online (yup, that biggest horror story ever!!) you can check to see if it's available in a store near you! I used the online store checker this morning to pick up another little steal that my lovely Insta friend @nataliejayne_semmens was sporting yesterday. I also purchased this one in a size 8. Sign of a good purchase.....I am wearing this this evening. The DH and I are off on a little overnight jolly to Brighton, we are taking advantage whilst our DD is at Brownie camp. Whilst I was perusing the rails in my local retail park store I also came across another fab shirt. 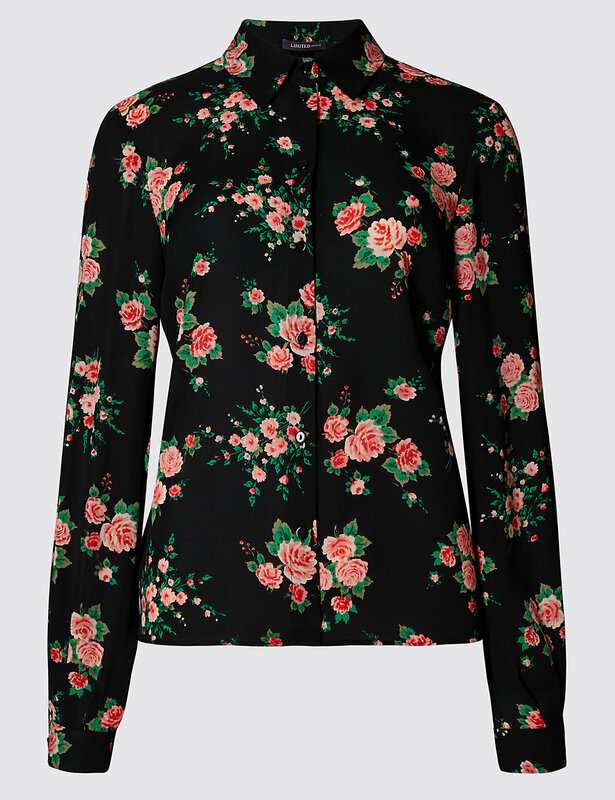 Perfect if a larger floral pattern is more to your liking and you prefer a proper collar. 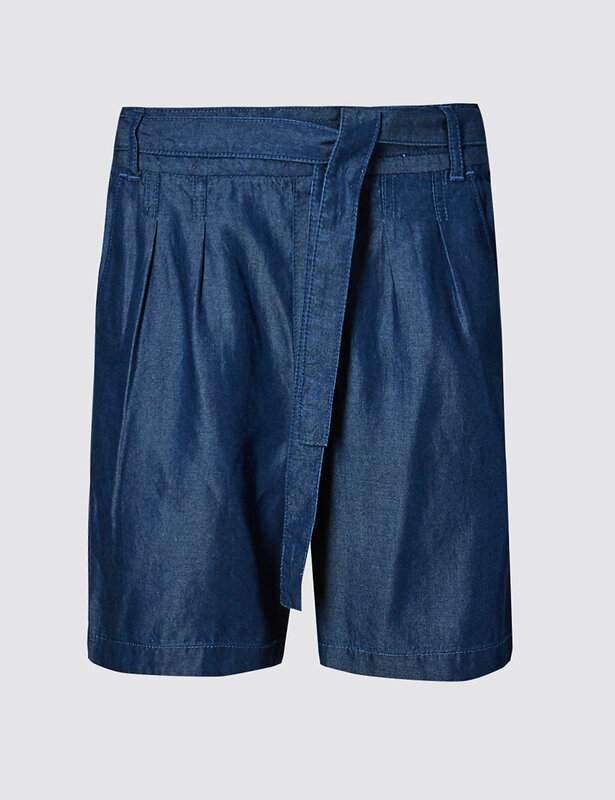 Another thing I'm kicking myself for not trying is these shorts.....I'm putting that down to the amount of times I may or may not get the wear out of them. I bet I will be chiding myself that I didn't pick up a pair once the promised heatwave is in full force. A right old bargain as they are only £9.50! As the reductions are so good I thought I'd have a quick look at what you can pick up online. I've found a couple of things with a good range of sizes left. How gorgeous is this slip dress for £18! A great little number to take you from day through to evening with a quick change of accessories! I definitely intend to check this one out! 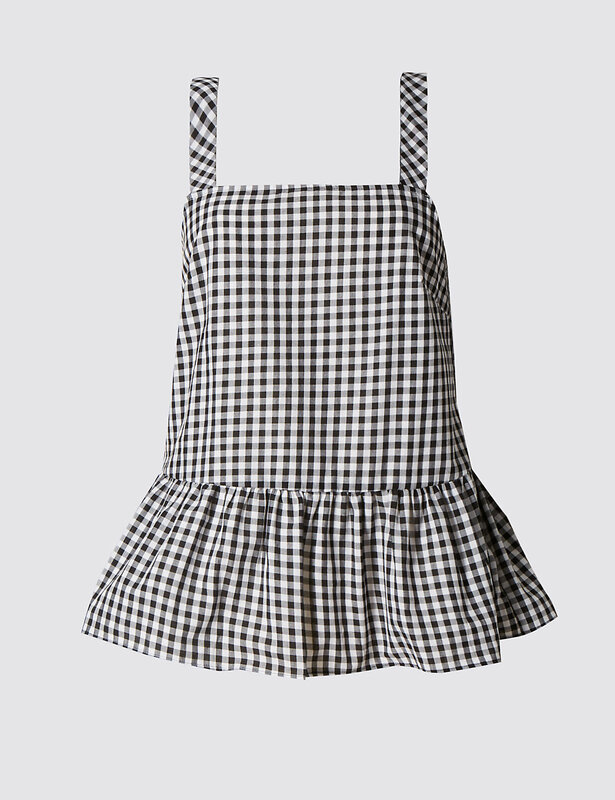 Smitten by this gorgeous gingham cami as well....another item that also needs investigating! Right....time to conclude my internet browsing before I do any more damage! Are you tempted by any of the M&S sale offerings? Have you picked up any bargains instore that I have missed....please do share! Right! Must dash as I have a train to catch! I actually tried that gingham blouse on a little while back but just because I'm so rubbish at wearing things up to the neck, I had to put it back but it's a pretty little number. And I love how all your bags are ancient. I think a lot of mine are too. 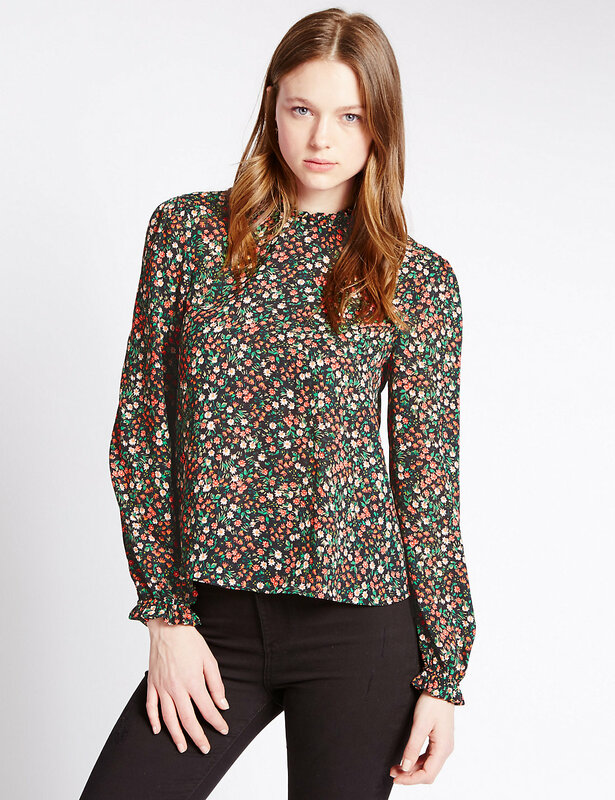 I've avoided ruffles and bows for exactly the same reasons Sue, but this little blouse has really won me over! I'm just running out of options for things to wear in this iffy weather! Love your styling. Great pics. I use m&s website all the time, with free click and collect to our local store. But I've never spotted the check stock button! That's fab! Thanks Michelle.